Parking permits are required on campus between Sept. 11 to Nov. 30, and between Jan. 21 and Apr. 26 (all dates inclusive). 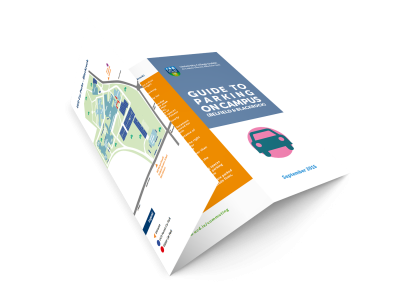 We have developed a user friendly guide to parking in UCD. Download it to have the most relevant information about parking in UCD with you. UCD is one of the largest journey generators in the Greater Dublin Area. Working with the National Transport Authority (NTA), Dun Laoghaire Rathdown County Council and other statutory bodies, UCD is committed to the ongoing development of a sustainable commuting strategy. This includes the introduction of car parking demand management to promote a shift away from car journeys and towards sustainable transport modes. UCD strongly encourages the use of public transport where possible. The 2015 UCD commuting survey showed that most of UCD’s population arrives to campus by public transport or other sustainable transport options. Some 24% of commuters travel to campus by car. From September 2015, a permit car parking system will operate on the UCD campuses to ensure that car parking is only used by members of the University community and as a means of controlling demand. Promote and support quality facilities and services to enhance commuting to and connectivity on campus.